Splitting water into hydrogen and oxygen is generally considered a fantastic way to get a renewable power source. The problem is how exactly you go about splitting the water. Current methods require some power input in order to kickstart the reaction, reducing its effectiveness as a sustainable power source, since power needs to flow continually in to the system. But a new technique could meld together a number of other methods and produce constant, carbon-neutral hydrogen from two things we have in abundance: fouled water and seawater. "This system could produce hydrogen anyplace that there is wastewater near sea water," said environmental engineer Bruce E. Logan. "It uses no grid electricity and is completely carbon neutral. It is an inexhaustible source of energy." Those are big claims, but the science here is intriguing. The basis of the technique is a power cell using microbial electrolysis, which requires some electrical input. In order to generate this electricity, the researchers set up chambers of seawater and fresh water, and used a system called reverse-electrodialysis or RED to generate energy from the ion difference between the two. However, this system isn't very efficient on its own, and would require a prohibitive number of RED membranes to generate the required electricity — and that's where the waste water comes in. They use exoelectrogenic bacteria which feed on organic matter to produce the final amount of juice required to set up the whole process. 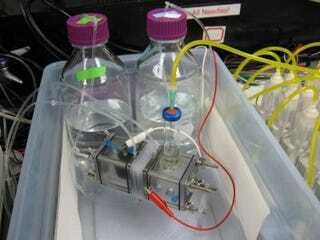 By creating a microbial electrolysis cell with five RED membrane pairs and the exoelectrogenic bacteria, the researchers have succeeded in generating enough power to produce hydrogen. As always, the question is efficiency, and these cells are produced between 0.8 to 1.6 cubic meters of hydrogen for every cubic meter of liquid through the cell each day. We have plenty of waste water. We have plenty of seawater. This just might be a way to use both of them to power our lives.